Remote access through wi-fi technology over your smartphone or tablet available. 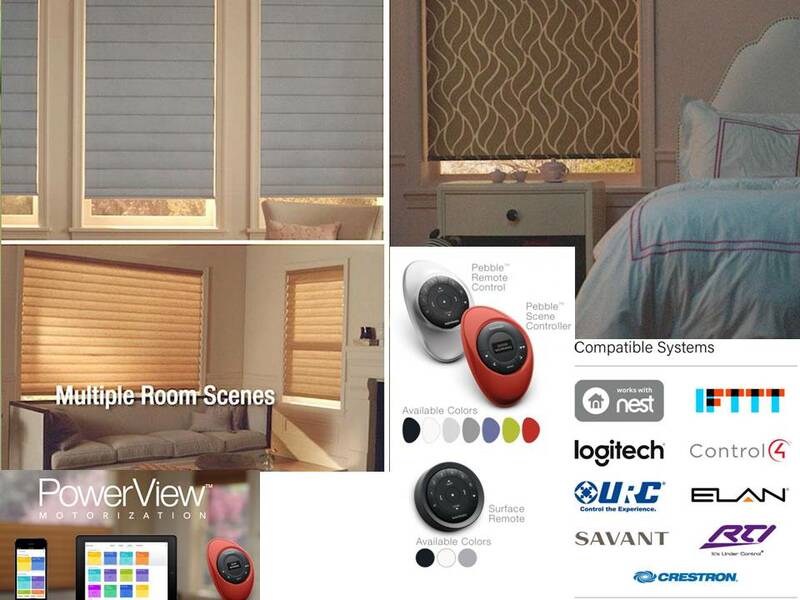 We are experts in PowerView ® • Qmotion ® • Somfy ® motorized blinds, shades, curtains and drapes. If you are looking for motorized blinds, shutters, shades, curtains or drapes, Windows Dressed Up has the latest in window treatment motorization technology from Hunter Douglas, Graber, Lafayette Interior Fashions and Somfy motors for curtains and drapes. Some of our motorized systems are compatible with home automation systems such as Nest, IFTTT, Logitech, Control, URC, Elan, Savant, RTI and Creston. Not all windows need motorized window treatments. High windows are most common, or those windows that allow a lot of heat and light in during the day can have motorized blinds that open or close on a set schedule. See all of motorization options in our showroom. Motorized blinds · motorized window shades · shutters · drapes are window treatments that can make access to hard to reach windows as simple as pushing a button or flipping a switch. For frequent travelers, automatic electric shades can give you an added level of security and be set on a timer or through your smart phone or tablet. Somfy and Qmotion motorized shades can be battery operated blinds or hardwired electic shades. Which treatments can be motorized? Motorized blinds, motorized shades, and other remote controlled window treatments offer enhanced child and pet safety, ease and convienence and are programmed to optimize energy efficiency. Hunter Douglas motorized blinds & shades are some of the quietest in the industry, and they believe that motorized window blinds & shades should be seen and not heard. PowerView is a battery operated system and very easy to install. No additional wiring is required in your home to use this system. You simply use a remote control device to open, close, and tilt your window blinds. Get the PowerView App to use your mobile device from anywhere! Hard-wired electric shades and electric blinds are also available with Hunter Douglas automated window shades products and are used with home automation systems. HunterDouglas® is a registered trademark of Hunter Douglas, Inc., as is PowerView ® and cannot be ordered online. Visit Windows Dressed Up showroom in Denver to order your custom window treatments. Somfy has a battery operated system that features built in radio technology as well as robust lifiting capacity. You can use the same control for integration with all Radio Technology Somfy controls and accessories. 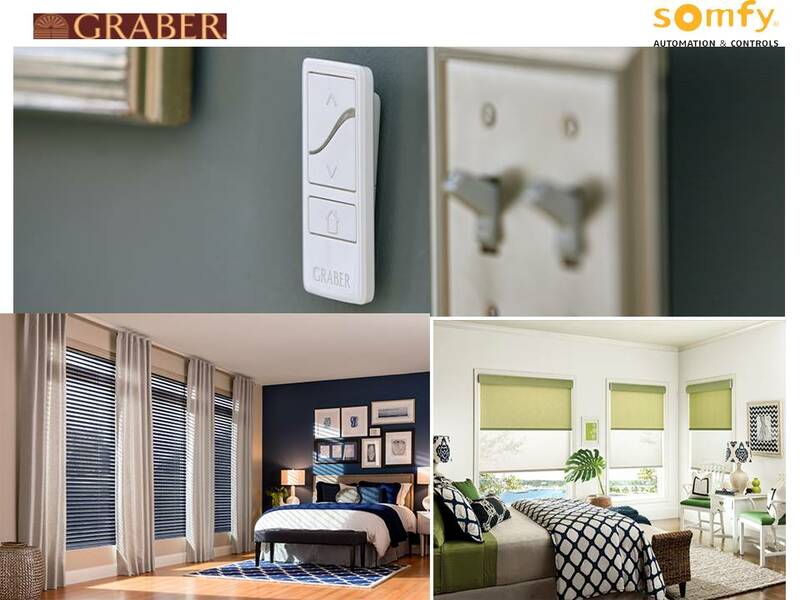 Graber automated motorized blinds and shades offer you the ultimate in simplicity, safety and style. Whether from a handheld remote control, wall switch or programmable timer, take complete control of your electric window shades from any room, any time. Graber ® is a registered trademark of Springs Window Fashions ® Somfy ® is also a registered trademark. Both cannot be ordered online. QMotion is an advanced Motorized system is available on Lafayette’s Genesis roller shade collection. This motor offers state of the art technology and sets new standards of excellence for automated blinds and shades. Easy to install and can be powered by low long lasting batteries. The system is the perfect option for commercial installations where pull cord blinds or shades remote don’t work. A gentle pull on the shade sets it into motion. Somfy motors has paired with Lafayette Interior Fashions to offer customers the most extensive array of choices to customize their window treatment control. Somfy Systems have battery operated, hard wired and home automation options. Auto-Lift is a battery operated motorization and has a unique IR/RF system that is offered on their Parasol cellular shades and Tenera sheer shadings products. Auto-Lift offers a simple and smooth control. QMotion ® Somfy ® Auto-Lift ® Lafayette Interior Fashions ® Parasol ® Tenera ® are registered trademarks and cannot be ordered online. Visit Windows Dressed Up’s Denver Showroom to operate our motorized blinds or shades on display. We have Hunter Douglas, Graber and Lafayette Interior Fashions. Test a cordless blind or blackout shades. Talk to a Certified Interior Designer to get more window treatment ideas. We also make custom drapes, bedding and have curtain rods and drapery hardware. Call us at 303.455.1009. Why Custom Motorized Blinds or Motorized Shades ? You have a choice of what you buy and where you buy it. If your window treatment is “off the shelf”, your choices are limited. Whether you are looking at drapes, blinds, shutters or shades, what more do you get when you order custom-made motorized blinds locally in Denver instead of at big box treatment?